Tri-Rail ( reporting mark TRCX) is a commuter rail line linking Miami, Fort Lauderdale, and West Palm Beach, Florida, United States. The Tri prefix in the name refers to the three counties served by the railroad: Palm Beach, Broward, and Miami-Dade. 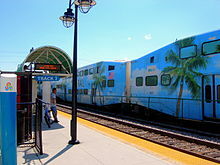 Tri-Rail is managed by the South Florida Regional Transportation Authority (SFRTA) along CSX Transportation's former Miami Subdivision,   the line now wholly owned by the Florida DOT. The 70.9-mile-long (114.1 km) system has 18 stations along the Southeast Florida coast, and connects directly to Amtrak at numerous stations, and to Metrorail at the Tri-Rail and Metrorail Transfer station and at Miami Airport station. A second Tri-Rail line on the Florida East Coast Railway corridor, dubbed the "Coastal Link", has been proposed. The line would operate between Toney Penna station in Jupiter and Virgin MiamiCentral in Downtown Miami, and add commuter rail service between the downtown areas of cities between West Palm Beach and Miami. Combined with the existing Tri-Rail line, the Tri-Rail system would have a daily passenger ridership of almost 30,000; or approximately 9 million passengers per annum, doubling Tri-Rail's current ridership. 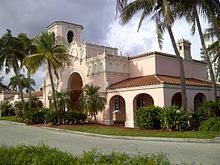 The West Palm Beach station, built in 1925, is one of the many original stations built by the Seaboard-All Florida Railway in the 1920s. Today, these stations are used by Tri-Rail and Amtrak. The line on which Tri-Rail operates was built by the Seaboard-All Florida Railway (a subsidiary of the Seaboard Air Line Railroad) for intercity passenger rail service in the early 1920s. The line was inaugurated on January 7, 1927. Intercity rail service by Seaboard operated the Orange Blossom Special service from New York City until 1953. Amtrak continues to offer passenger rail service with the Silver Star and Silver Meteor trains from New York City. Today, the original 1920s Seaboard stations are used by Tri-Rail for service at West Palm Beach, Deerfield Beach, Fort Lauderdale, Hollywood. Though no longer in use, the Seaboard stations at Delray Beach, Opa-locka, and Hialeah are still standing. Due to higher than expected ridership, Tri-Rail outlasted its temporary status, adding more trains and stations in the process. Line extensions have enabled Tri-Rail to serve all three South Florida international airports: Miami International Airport, Fort Lauderdale–Hollywood International Airport, and Palm Beach International Airport. The state's original plan was to use the more urban Florida East Coast Railway (FEC) line, but FEC declined the offer as it wanted freight to be their top priority. In 1998, the initial 67-mile-long (108 km) route was extended north from the West Palm Beach station to the Mangonia Park, and south from Hialeah Market to Miami Airport (at an earlier station on the site of the current station). Construction of the extensions began in 1996; which added nearly 4 miles (6.4 km) to the system. In 2007, a project to upgrade the full length of the line from Mangonia Park to Miami Airport with double track was completed with the opening of a high-level fixed bridge over the New River near Fort Lauderdale. During the 2000s, most of the stations were completely rebuilt to accommodate for double tracking and include dual platforms, elevators, pedestrian bridges over the tracks, large roofs over the platforms, and better facilities. Fort Lauderdale station, built in 1927, serves Tri-Rail and Amtrak. In 2009, Tri-Rail service was nearly cut drastically, with the threat of being shut down altogether by 2011,  even as ridership was at a record high, as Palm Beach County withheld its funding of the system and looked to cut its funding from $4.1 million to $1.6 million per year. This would mean that Broward and Miami-Dade counties would also have had to cut their support to $1.6 million each to match. The state, which was also running a budget shortfall and did not pass a rental car tax increase to help fund Tri-Rail, would have had to cut its support as well. This would have caused an immediate cut from 50 to 30 daily trains and a complete cutting weekend service, followed by additional cuts and possible shut down two years later. Schedules were decreased slightly, but service was never cut altogether, as dedicated federal funding was attained through the $2.5 million grant as part of the American Reinvestment and Recovery Act of 2009. Miami Airport station opened in April 2015. It is the largest station in Florida, serving Tri-Rail, Metrorail, and buses. In early 2012, it was announced that a second Tri-Rail station in Boca Raton was once again being considered at the busy intersection of Glades Road (S.R. 808) and Military Trail (S.R. 809), near Town Center Mall, Florida Atlantic University and large office parks. A station was proposed for this location in the early 2000s while many other stations were being renovated. Boca Raton station near Yamato Road (S.R. 794) is the busiest station in the system  as of 2014, with 1,600 riders a day,  surpassing the Tri-Rail and Metrorail transfer station in Miami-Dade County. For this reason, and the fact that Glades Road is considered the most congested road in the county, an infill station there has been long considered. As of 2016 [update], the station was not under construction. 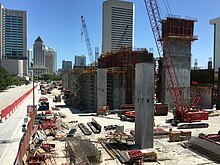 Virgin Trains USA's Virgin MiamiCentral station under construction in 2016. Tri-Rail fare is divided into six zones for one day passes, ranging from $2.50 to $11.55, with fare calculated by the number of zones travelled through, and whether it is one way or round trip. On weekends, a $5 all day pass good for all zones is available, though trains run with very long headways. For frequent use, Tri-Rail offers a $100.00 monthly pass (good for Tri-Rail only) and a $145.00 regional monthly pass good on Tri-Rail, Metrorail, and Metrobus. Discount fares are available for senior citizens, the disabled, students, and children under five. Certain businesses allow their employees to register for the Employer Discount Program, which reduces their fares by 25%. Free parking is available at most Tri-Rail stations. On weekdays, 50 train trips are made in all, with 25 in each direction, while on weekends only 32 trips, 16 north and 16 south, are made in all, with 1 hour headways between each train. While Tri-Rail peaks at speeds above 80 miles per hour (129 km/h), it can be extracted from the timetable and the distance of the line that its overall average speed is approximately 38 miles per hour (61 km/h). The service began with five Morrison-Knudsen F40PHL-2 diesel locomotives. Tri-Rail later took delivery of three MotivePower Industries F40PH-2C locomotives and two ex-Amtrak EMD F40PHs. In 2006, six EMD GP49 locomotives were acquired from Norfolk Southern Railway and were rebuilt by Mid America Car Company to the designation GP49H-3. On February 25, 2011, Tri-Rail announced an order for ten Brookville BL36PH locomotives, with options for thirteen more, from the Brookville Equipment Corporation at a cost of $109 million. The purchase was met with criticism by the Florida Chamber of Commerce and state lawmakers, who claimed the bidding process was flawed. Rival bidder MotivePower Industries filed a lawsuit against Tri-Rail, claiming that the bidding process was skewed in Brookville's favour. Tri-Rail later added two more BL36PH locomotives to the order for a total of twelve. As of 2015, all locomotives have been delivered and are used in regular service, allowing the F40PHL-2, F40PH-2C and F40PH locomotives to be retired. Tri-Rail uses two types of passengers cars. Since the beginning of operations, the system has used 26 Bombardier BiLevel Coaches purchased new from Urban Transportation Development Corporation (even though they were delivered in GO Transit colours, the Tri-Rail cars were purchased new and never used or sold secondhand by GO), a common model among Canadian and US commuter railroads, 11 with operating cabs and 15 without. Briefly, bi-level rolling stock from Colorado Railcar (4 DMU power coaches and 2 unpowered coaches) was used beginning in 2006. In 2015, three Bombardier coaches were renovated to include additional bicycle capacity. Cars 1002, 1006, and 1007 had one side of seating removed from the lower levels, which were in turn replaced by bike racks. These trains with special bike cars have the capacity to carry an additional 14 bicycles per train. To accommodate for the loss of seating, these trains have four-car consists. In 2003, after receiving a grant from the Florida Department of Transportation, Tri-Rail contracted to purchase two pieces of rolling stock from Colorado Railcar: a self-propelled diesel multiple unit (DMU) prototype control car and unpowered bi-level coach entered regular service with Tri-Rail in October 2006. The new purpose-built railcars are larger than the Bombardier BiLevel Coaches, holding up to 188 passengers, with room for bicycles and luggage. Tri-Rail possessed four DMU control cars and two unpowered trailer cars. One DMU train usually consists of two DMU power cars at each end of a trailer coach (making for two complete DMU+trailer+DMU sets on the system). One trainset was sent to the SunRail Rand Yard in Sanford, FL, months before the system opened, for test purposes on their new commuter line. The trainset was sent back to the CSX Hialeah Yard soon after SunRail began revenue service. 1968 (Rebuilt 1988) M-K EMD F40PHL-2 801–805 3 crew These were the first diesel locomotives in service by Tri-Rail. Rebuilt from CR GP40 locomotives 3230, 3238, 3240, 3252 and 3256 in 1988. Retired 2015. 1981 M-K EMD F40PH 807-808 3 crew Formally Amtrak No. 363 and 379. Retired 2015. 1981 M-K/MPI F40PH-2C 809-811 3 crew All locomotives had new engines to improve head end power. Retired 2015. 1980 (Rebuilt 2006) EMD GP49PH-3 812–817 3 crew Ex-Norfolk Southern 4600-4605 GP49s. Locomotives were rebuilt and reclassified as GP49PH-3 in 2006 giving more horsepower than before. 2010-11 Hyundai Rotem Passenger Coach/Cab Car 512–521 (cab cars), 1101–1114 (trailer cars) 140 and 3 crew (cab cars), 146 (trailer cars) Tested in 2010 and all are in service since 2013. 2002 Colorado Railcar Single-Level DMU Demonstrator 702 73 and 3 crew Formerly Colorado Railcar #2002. This unit was tested across the United States and Canada and was tested in select commuter railways in the US's metropolitan area and Alaska to promote companies for adding DMUs to their rosters. It was soon brought and sold by Tri-Rail and was repainted to their railway colors and was given a new number in 2004. It is now stored unservicable in Pueblo, Colorado, after it was sold away. Bi-Level DMUs soon arrived to Tri-Rail after the demonstrator was returned to Colorado. 2005-07 Colorado Railcar Bi-Level Trailer Coach 7001-7002 182 Double Decker Coaches that usually transit with two DMUs. They are much larger than the Bombarder and Rotem coaches and they have a very large seating capacity too. A typical station contains two tracks and two side platforms connected by an overpass. Most stations have large parking lots, however, some, like West Palm Beach and Hollywood have a limited number of spaces, most of which are reserved for Amtrak travelers. Opa-locka features Moorish Revival architecture similar to historic buildings in Opa-locka. Previous Miami Heat victory parades resulted in high ridership counts for Tri-Rail, as well. On June 23, 2006, Tri-Rail transported 18,613 riders; and on June 25, 2012, the agency carried 18,355 passengers. On January 4, 2016, a passenger train collided with a garbage truck which had broken down on a grade crossing at Lake Worth station and was derailed. Twenty-two people were injured. This marked the first derailment in almost 27 years of operation. Derailed Tri-Rail cars in Lake Worth on January 4, 2016. View of the train and garbage truck it struck in Lake Worth. Wrecked crossing signals at the site of the Lake Worth accident. ^ a b "APTA Ridership Report - Q4 2013 Report" (pdf). American Public Transportation Association (APTA). February 26, 2014. Retrieved 2014-03-14. ^ "Tri-Rail Train Schedule". 9 July 1997. Archived from the original on 9 July 1997. ^ "TRI-RAIL South Florida's Commuter Rail System". GetCruising.com. Retrieved 2011-11-10. ^ "Tri-Rail's hardtimes WTVJ 1990". WJTV/YouTube. Retrieved 2011-12-02. ^ a b c "Officials seek public input on new transit option along FEC tracks". Sun-Sentinel. September 16, 2010. Retrieved 2011-11-14. ^ Gibson, William E. (April 10, 2001). "TRI-RAIL GETS BOOST IN U.S. BUDGET SHORTFALL: BUSH'S BUDGET PROPOSAL LEAVES EVERGLADES PROJECTS OUT $58 MILLION". Sun-Sentinel. Retrieved 2011-12-02. ^ Turnbell, Michael (June 20, 2002). "Tri-rail Upgrade To Speed Service". Sun-Sentinel. Retrieved 2011-12-01. ^ a b "Now we can get you to work faster..." (pdf). SFRTA. Retrieved 2012-01-12. ^ "Gov. Rick Scott raps Tri-Rail while rejecting high-speed rail funding". Politifact. 2011-03-01. Retrieved 2018-12-29. ^ "I-95 express lane construction comes to Broward starting Nov. 28". Sun-Sentinel. Retrieved 2011-11-23. ^ "We can't let Tri-Rail close!". CNN. June 7, 2009. Archived from the original on April 21, 2010. Retrieved 2011-11-28. ^ Polansky, Risa (April 2, 2009). "Tri-Rail may be forced to cut half its weekday routes, eliminate weekend service". Miami Today News. Retrieved 2011-11-28. ^ a b "Comprehensive Annual Financial Report, Fiscal Year Ended June 30, 2013" (PDF). South Florida Regional Transportation Authority. December 12, 2013. Retrieved 2014-06-12. ^ Salisbury, Susan (December 9, 2011). "Driving on the decline as gas prices remain above $3 a gallon". Palm Beach Post. Retrieved 2011-12-09. ^ Turnbell, Michael (January 12, 2012). "Tri-Rail's ridership soars in 2011". Sun-Sentinel. Retrieved 2012-01-12. ^ Turnbell, Michael (November 27, 2011). "New Pompano Beach Tri-Rail station will be solar-powered". Sun-Sentinel. Retrieved 2011-11-28. ^ Turnbell, Michael (November 25, 2011). "Rough railroad crossing in Pompano Beach irks jostled drivers". Sun-Sentinel. Retrieved 2011-12-01. ^ David Smiley (11 April 2015). "Push to build Miami Tri-Rail station driven by desire as much as data". Miami Herald. Retrieved 2015-04-14. ^ "The trains are too long. The platform is too short. Bad news for the new station". Miami Herald. January 29, 2017. Retrieved 2017-01-30. ^ Turnbell, Michael (April 5, 2015). "Tri-Rail opens Miami airport station". Sun-Sentinel. Retrieved 2015-04-05. ^ a b c "Massive Tri-Rail deal approved after bids tossed, warnings issued". Miami Herald. January 27, 2017. Retrieved 2017-01-30. ^ Streeter, Angel (January 4, 2011). "Second Tri-Rail station in Boca Raton proposed". Sun-Sentinel. Retrieved 2011-01-04. ^ Philip D. Latzman (April 7, 2015). "As ridership increases, Boca Raton embraces train travel". Sun-Sentinel. Retrieved 2016-08-19. ^ Angel Streeter (May 11, 2014). "New Boca Raton Tri-Rail station on the horizon". Sun-Sentinel. Retrieved 2016-08-19. ^ "Tri-Rail Open WJTV". WJTV/YouTube. 1989. Retrieved 2011-11-27. ^ "Miami Downtown Development Authority hashing out plans to bring Tri-Rail downtown". Miami Today News. October 29, 2009. Retrieved 2011-02-27. ^ "S. FL Freight and Passenger Rail Enhancement Project". Florida Department of Transportation. Retrieved 24 August 2017. ^ Turnbell, Michael (30 January 2015). "Tri-Rail link to downtown Miami needs $69 million in funds to happen". Sun Sentinel. Retrieved 2015-11-23. ^ Maruri, Katya (17 April 2018). "Tri-Rail won't roll into downtown Miami this year". Miami Today. Retrieved 11 May 2018. ^ "Tri-Rail Coastal Link Project Update" (PDF). Tri-Rail Coastal Link. Retrieved 24 August 2017. ^ a b Barszewski, Larry. "Difficult track ahead for coastal commuter rail". Sun Sentinel. Retrieved 24 August 2017. ^ "Tri-Rail Coastal Link System Map" (PDF). Tri-Rail Coastal Link. Retrieved 2015-02-18. ^ Turnbell, Michael (April 6, 2015). "Tri-Rail falters in first week of dispatching". Sun-Sentinel. Retrieved 2015-04-13. ^ "rider_info/fare_information". tri-rail.com. Retrieved 2017-04-07. ^ "rider_info/transfer_info". tri-rail.com. Retrieved 2017-04-07. ^ "Calculating Your Fare". Tri-Rail. Retrieved 2013-10-28. ^ "Save Money on Holiday Travel by Riding Tri-Rail to Airports Across South Florida". prweb.com. Retrieved 2011-12-04. ^ a b "South Florida Regional Transportation Authority Comprehensive Annual Financial Report, Fiscal Year Ended June 30, 2010" (PDF). SFRTA. ^ Smiley, David (April 11, 2015). "Push to build Miami Tri-Rail station driven by desire as much as data". Miami Herald. Retrieved 2015-04-12. ^ "South Florida Regional Transportation Authority". Sfrta.fl.gov. Retrieved 2011-02-27. ^ a b "$109 Million Tri-Rail Contract Awarded After Challenge". Sunshine State News. February 25, 2011. Archived from the original on February 27, 2011. Retrieved 2011-02-27. ^ a b Michael Turnbell (January 5, 2013). "Tri-Rail gets new, safer passenger cars". Sun Sentinel. Retrieved 2013-05-09. ^ "Tri-Rail faces more challenges than crowded cars". Sun-Sentinel. December 2, 2011. Retrieved 2011-12-02. ^ a b San Juan, Rebecca (August 7, 2018). "Tri-Rail targets third quarter 2019 runs to downtown Miami". Miami Today. Retrieved January 5, 2019. ^ "2002-2007 Annual Ridership through March 31, 2007" (pdf). SFRTA. Retrieved 2011-12-11. ^ Kittelson & Associates, Inc. (August 2007). "Performance Measurement Evaluation" (pdf). SFRTA. Retrieved 2011-12-11. ^ "Annual Update Final Draft" (PDF). ^ "Tri-Rail scores record daily ridership due to Miami Heat parade". SFRTA/Progressive Railroading. June 2013. Retrieved 2013-06-26. ^ Sutton, Scott; Noce, Christina; Sarann, Gabrielle (4 January 2016). "Tri-Rail hits garbage truck in Lake Worth; 22 people suffer minor injuries". WPTV. Archived from the original on 7 January 2016. Retrieved 2016-01-05. ^ "Delays expected after Tri-Rail train derailment in Pompano Beach - WSVN-TV - 7NEWS Miami Ft. Lauderdale News, Weather, Deco". 2016-01-28. Archived from the original on 2016-01-29. Retrieved 2016-11-16. 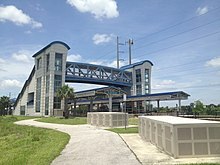 Wikimedia Commons has media related to Tri-Rail.